When I paint in oils, because there is such a small space to work in, I have to be so careful that I don't slosh paint over everything. Currently I'm working on my largest painting ever. It's nearly finished - another three or four days I think. Then to wait until the paint dries before it gets varnished and I take it to be framed. It's quite strange when I look at the black cat on the sweep's shoulder its eyes stare at me and the sweep seems to look away a bit. But when I look at the sweep his eyes follow me round the room and the eyes of the cat look away. I'll put a picture of the final painting on my blog when it's all done. 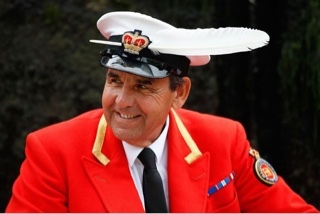 David will be taking them all to The Vintners Hall in London on Monday where the original now hangs in 'The Swan Room'. 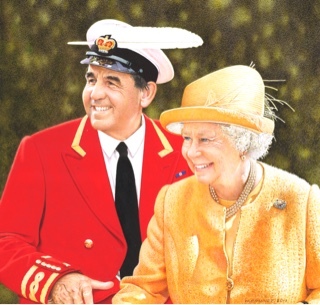 This is a painting of David with Her Majesty the Queen which I painted recently. While we were in Cookham we visited the Stanley Spencer Gallery. He's one of my favourite artists. Of all his many paintings the one I like best is of Christ Teaching at Cookham Lock. He died before he could finish it, but the way he drew everything out in incredible detail really intrigues me. In the museum is a half hour video of his life. Well worth seeing. 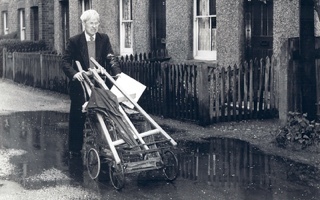 Here he is walking around Cookham carrying his easel on his old pram. 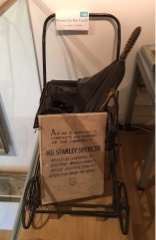 And in the museum his actual pram is on display. Yesterday we drove to Cranleigh to see Paul and Jackie Eaton. Paul is a jeweller and also wins many awards for his bronze, gold and silver small sculptures. The reason for the visit was to take the two tiny miniature portraits I made of the Sultan of Pahang for him to fix into the elaborate gold and diamond brooches. They will soon be worn by the Sultana on ceremonial occasions. I must say the portraits sparkled when surrounded by diamonds. On the way home we stopped at the Farnborough Air Sciences Trust Museum. It's quite small but contains several fascinating items to do with the early days of flying. 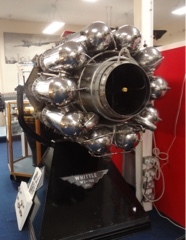 For example this is a jet engine developed by 'The father of the jet engine' - Sir Frank Whittle. 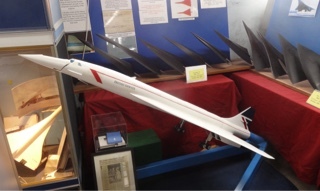 Another really interesting display is of Concorde. Here you can see a number of trial shapes for this iconic aircraft. 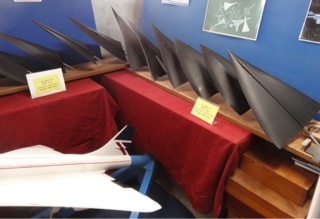 Wind tunnels have been used to measure aerodynamic forces on models since before the days of powered flight. Here at Farnborough there are several wind tunnels ranging from large and small low speed facilities up to large supersonic tunnels. 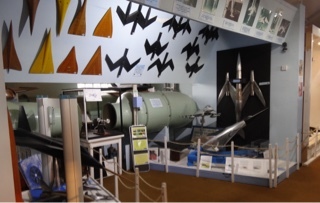 In this case at the museum you can see some of the smaller models tested. In one of the rooms is a pavilion devoted to the life of Samuel Franklin Cody - Britain's first pilot. 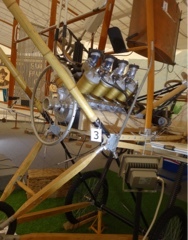 Here there is a full size replica of the British Army Aeroplane Number 1A. 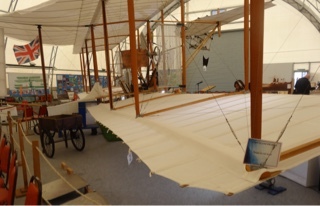 It was flown by Cody at Farnborough on 16th October 1908, this being the first recognised powered, heavier than air, controlled and sustained flight in Great Britain. And this is a close up of the engine itself. This aircraft flew under its own power for 27 seconds and covered 1390 feet and counted as the UK's first flight. 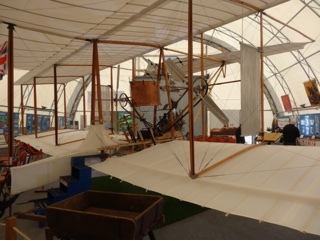 This replica was unveiled to the public on the centenary of that first flight on 16th October 2008. 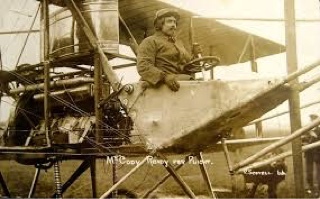 Cody went on to build seven more aircraft, but on 7th August 1913, whilst giving a pleasure flight to a Mr W. Evans, a recently retired Hampshire cricketer, something on his aircraft broke, causing a manoeuvre so violent that Cody and his passenger fell from the aircraft whilst at 300 feet and both were killed instantly. 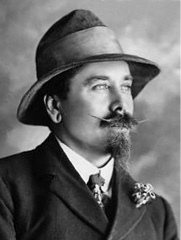 Cody was given a full military funeral and is buried in the Aldershot Military Cemetery. I mentioned on my last blog that my watercolour painting of the boatman will be on display at the Royal Institute of Watercolour Painters from the 3rd of April at the Mall Galleries in London. We'll be going to the Private View on the 2nd so I'm hoping it will be hung prominently. However I'm really excited about another event coming up soon. Each year The National Portrait Gallery in London holds the world's most prestigious portrait exhibition. Called the 'BP Portrait of the Year' only about 35 paintings are selected for a two month long exhibition at the National Portrait Gallery. Artists are only allowed to enter one portrait each and the top portrait artists throughout the world submit their work. This year nearly 4,000 entries have been received. 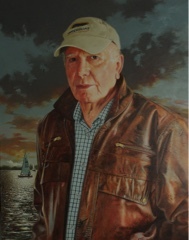 So I was delighted the other day to be told that my oil painting - 'Alan, the Boatman' has been selected for the final stage. Just 400 have reached this far and we are due to take the painting for final selection in a couple of weeks time. It's a real longshot to be amongst the final 35 as I'm up against the best in the world but at least there's a chance. 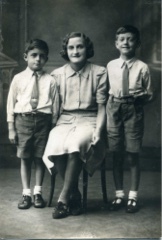 And as it's Mothering Sunday today I thought I'd show a photograph of my mother and her two sons, taken during the war. Bob is on the left and I am on the right. Long gone but never forgotten. Now to get back to the Flueologist and his cat, Costya.